We've all heard about it, know people with it-- that insidious syndrome of widespread muscle pain, persistent fatigue, sleep disturbances and depression. Most people who have been diagnosed with Fibromyalgia experience a feeling of helplessness as to what to do about it. No one else seems to understand how they feel, know what to do for them, or worse-- say that it is all in their head! Fibromyalgia is not a mental disorder. Objective verification of the biological abnormalities of Fibromyalgia patients has made it clear that Fibromyalgia is a Metabolic disorder. As with most biological disorders, it may be modified by psychological factors. "Type A" personalities that are always "go-go-go", taking care of everyone except themselves, and end up burning themselves out (there are a high percentage of nurses and school teachers that develop fibromyalgia). Traumatic stress. Long term physical or emotional stress, as well as victims of abuse. Prolonged chemical exposure to substances such as synthetic drugs, solvents, poisons, pesticides, petroleum, Agent Orange, and Gulf War chemicals. Other factors that contribute to Fibromyalgia are poor diet and nutritional deficiencies, physical deconditioning, interacting medications and imbalances of other hormones. For patients to improve or recover, the influences of these factors must effectively be reduced or eliminated. This is where our Protocol comes in. We work to rehabilitate the metabolic functioning of the body so that it may return to rebuilding itself rather than fighting itself and breaking down. This form of treatment provides marked improvement or complete recovery that is sustained long term for most patients. Consequently, they require either minimal or no further healthcare services under the diagnosis of Fibromyalgia! A major component of the Protocol is the feedback from objective measures of the Fibromyalgia status. We monitor the patient's status at intervals using objective measures, and post the scores as data points on line graphs. This ensures compliance to the Protocol by demonstrating clinical improvement over time in an objective format. One can clearly see positive changes on the graphs as the patient is recovering, and their quality of life improves. The body is electric, and as such, generates very small electrical potentials. 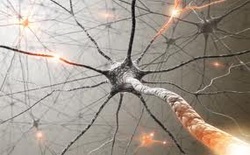 The nervous system is electrical and controls all the functions of the body. The metabolic processes are electrical-- indeed, chemical processes themselves are electrical in nature (bonding of atoms through pairing of available electrons which interact like tiny magnets.) Therefore, the resulting electrical potentials naturally have a polarity, which when functioning properly, contribute to the overall electromagnetic flow of the body. When the electromagnetic flow is disturbed (i.e. the Meridian system), the cycles of the body are affected, which alters metabolic systems and the rhythms that should naturally sequence throughout the body. For example, while stress (real or imagined, physical or emotional) can aggravate pain, stress definitely causes disturbed sleep patterns; this in turn produces Fibromyalgia symptoms, especially in individuals with borderline metabolic functioning. The disturbed sleep further slows metabolism enough to cause symptoms of hypo-metabolism. Studies show, however, that individuals with high levels of aerobic fitness are resistant to developing Fibromyalgia symptoms when they are subjected to disturbed sleep. It has been observed that sedentary people are more prone to develop Fibromyalgia symptoms. This observation provides a clue that perhaps the metabolism in certain tissues is slow enough to cause symptoms of cellular damage. This in turn stimulates the sympathetic nervous system (fight or flight), while depressing the autonomic nervous system (resting and digesting), so that the body is in a constant state of alarm. This is a vital protective mechanism in times of danger, as the body is designed for survival-- but there is a long-term cost. Chronic stress breaks down the body. Recommendations are provided for rebuilding the body nutritionally using highly concentrated, vitally active foods. This allows the body to regain the ability to regenerate itself from the inside using the proper building blocks needed to feed the cells at that level. Unadulterated foods have the electrical signature that nature intended. Synthetic products (including foodstuffs!) may have the same chemical "formula", but will have different electrical signatures. This is due to the fact that processing breaks apart molecular bonds and reforms them into other arrangements, resulting in isomers of each other-- that is , with unnatural electrical signatures! Man cannot improve upon Nature. We also work with the body itself to facilitate the Healing process innately present in each of us and all living beings. By working to restore proper functioning of the nervous system, the autonomic processes (resting and digesting) can increase, which decreases the sympathetic processes (fight or flight). 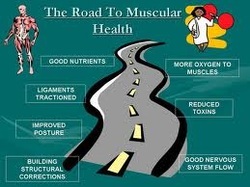 The body can then operate more efficiently. 2. Pain Distribution by percent of the body affected. Pressure measurements are taken of all 18 tenderpoints and charted (using an algometer). A change in pain threshold to pressure reflects a generalized change in the pain affecting both tender and control points. 4. Fibromyalgia Impact Questionnaire and Zung's self-rating Depression Scale. A self administered pencil and paper questionnaire that measures physical function, work status, depression, anxiety, sleep, pain, stiffness, fatigue and sense of well being. An assessment of symptoms indicating systemic toxicity. Each score is posted to a separate line graph so that through subsequent evaluations, the Fibromyalgia status can be charted over time and one can easily see the trends of progression documented. Only substantial changes in patient status are likely to show up as trend lines on the graphs, therefore reflecting changes in patient status that are clinically significant. Based on the individual's presentation, a nutritional regimen will be recommended, as will physical modalities most likely to be effective in facilitating the road to recovery. With this in mind, when you are ready to find relief from your condition, you may reach us through information on the Contact page. I recommend only the highest quality products for my patients, and have had tremendous luck with Essential Therapeutics for those with Fibromyalgia and Chronic Fatigue Syndrome (CFS). I have arranged with the VIP Dispensary to make available directly to the patient the very supplements I recommend. However, which particular supplements you may need can only be determined by the assessment described above. 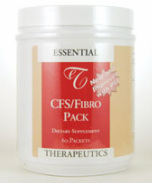 Once determined, you may purchase nutritionally supportive products (such as the CSF/Fibro support pack to the left) directly from the company. The password as well as the instructions needed to access the dispensary can be found on our Store page.